Groenevakantiegids - Kmetija "Na meji"
This small farm is located in the middle of unspoiled nature, at the edge of the great Javorniki forest. Peace, clean air and beautiful views. At the same time it is only 12 km away from the highway. The region is part of NATURA 2000 protected regions in Slovenia. Many animals live here, including bears and wolves. The farm is surrounded by a big garden with fruit trees and a vegetable garden. No chemicals are used. The owners are producing honey, jams, juices, spirits and liquers and are very ecological orientated: they save water by turning used waste water into clean water, collect rain water and separate waste. 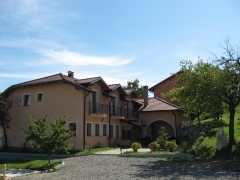 For bed & breakfast there are six modern furnished rooms. They all have their own bathroom, TV and balcony. There is a big kitchen where local food is prepared and old fashion dining rooms offer a nice atmosphere for breakfast and dinner on request. In front of the farm is a parking lot, where you can also park motorhomes. Bicycles are for rent and pick-up service for when you get lost. Horseriding is possible at the neighbour farm. If you stay longer than three nights, you get a price reduction. The farm is surrounded by a huge, untouched forest full of animals and interesting plants. Also it is located in the karst area, a special limestone land with interesting shapes, periodic lakes and rivers and many, many caves. Very close are some of the most famous tourist sights in Slovenia: Postojna cave (12 km), Škocjanske caves under UNESCO protection (30 km), Predjamski in Snežniški castle (25km) and Lipica (40 km). From the farm it is 50 km to the Adriatic sea.